The challenge: to profile the children and families helped by this fine mental health organization over the past nine decades. Designer: HutDogs, Inc.
Ninety years ago, a group of forward thinkers, spurred by an interest in the well-being of children, and increasingly convinced of a link between mental and physical health, launched several first-of-their-kind mental health clinics for children in America. On Feb. 6, 1924, the Los Angeles Times declared in Page One news: "Of far-reaching import to parents and children of Los Angeles, announcement was made yesterday of the establishment of a child guidance clinic in the city." Providing support for the initial eight pilots was the non-profit Commonwealth Fund in New York. 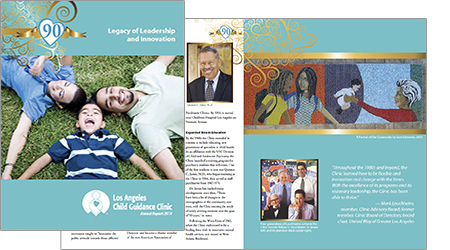 From the beginning, the Child Guidance Clinic of Los Angeles was founded on a commitment to prevention, a sense of innovation, a belief in community partnership, and a multidisciplinary approach— all of which continues nine decades later.